Andrew was always taken with the fishing game sold in stores, the one where the fish go around in a circle while opening and closing their mouths while you try to get the end of the fishing line in their mouths. He got one and was extremely frustrated. I tried it and got extremely frustrated. The mouths close so quickly and with the fish moving around, I’m not sure how he could be successful with this. 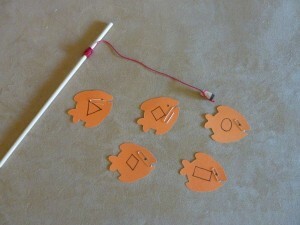 I decided to make my own fishing game, adding a bit of a My Obstacle Course twist on it (of course!). I know they sell fishing rods with magnets on the end of the line, but I wanted to see if I could make my own. I went to Michael’s and bought some small dowel rods, red string (red is the easiest color to see), corks, sturdy needles (to go through the cork), circle magnets that would fit on the corks and glue. I glued the magnet to the narrow end of the cork and let it sit overnight to dry. 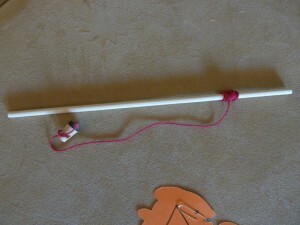 Then I used the needle to attach the cork to the string and wound the other end of the string around the dowel (towards the end of it, without being too close to where it could fall off). Note: This is one of those things that would be awesome to purchase and make with a group of other people since the materials were all sold in packs. The rod was complete and now I needed something to fish. 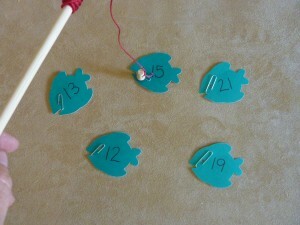 I had some fish calendar cutouts and attached some paper clips to them. All I had to do was think about what I wanted to work on with Andrew and write that on the cutout. 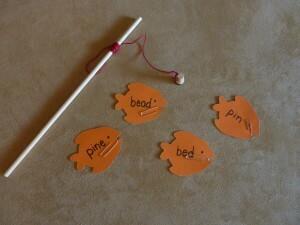 Below you will see just some of the possibilities for things to put on the fish. 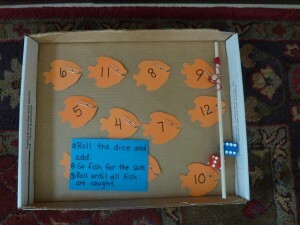 My Obstacle Course Station Activity: Fishing for sums. 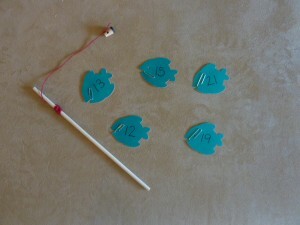 During the station, he would use the fishing rod to “catch” the correct fish. He had a ball with it and was able to work on steadying his hand, lowering the cork down to the correct fish and “catching” it on the paper clip. So fun, much more motivating and no batteries required! !